Sir Ian Botham has backed controversial plans by the England and Wales Cricket Board to introduce a new format for its city-based competition, despite widespread criticism within the game. The former England all-rounder believes ECB chairman Colin Graves is right to press ahead with the ‘Hundred’ concept in the hope that it is capable of matching the global success of the Indian Premier League and Australia’s Big Bash, which are both played under Twenty20 rules. 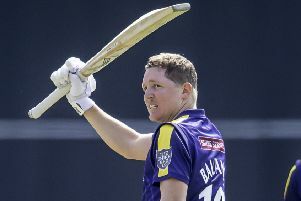 But the Durham chairman’s comments are in contrast to those of other current players, including his county’s captain Paul Collingwood, who led England to their T20 World Cup victory in 2010 and believes a bigger effort should be made to exploit the existing competition, the T20 Blast. Botham, though, thinks the new tournament, due to start in 2020, could compete with the other popular franchise leagues. He said: “The game has to move on. I think we’re in danger of diluting the red-ball game too much and going down the one-day road, but that’s what the public wants at the moment and we’re trying to do something different. “No-one’s agreed anything yet regarding the new competition so we’ll have to wait and see how it all falls into place. But we needed a competition in England to compete with the Big Bash and the IPL – everyone else has one and we’ve been slow to pick up on it. “If you do it properly and learn lessons from what the other competitions have done. You can learn a lot from other people’s mistakes. Botham was speaking at a ceremony to mark the renaming of a pavilion at Durham’s ground in honour of Collingwood, whose one-county career began when he was picked up from his local club Shotley Bridge in 1995. Collingwood said: “I’d sometimes question where they (the ECB) get the figures from. I turned up last night, at Shotley Bridge cricket club at 6pm on a Thursday, and there were 120 kids down there enjoying the game. “If you took that survey around the north-east it wouldn’t be very accurate. Graves’s promotion of the new ‘Hundred’ format has received similar criticism, not least from those who believe efforts should still be centred around the T20 Blast, which the former Yorkshire chairman described as “mediocre” in 2016, despite soaring ticket sales which last year alone topped 880,000. It is perhaps understandable that Collingwood should feel particularly attached to the T20 format, which was itself roundly questioned upon its inception, having captained England to their only global title in the West Indies in 2010. Collingwood added: “T20 cricket has been working around the world, and it is proven that it will continue working because people keep turning up.